St. Patty’s day may have passed, but that doesn’t mean we can’t continue the lucky streak! 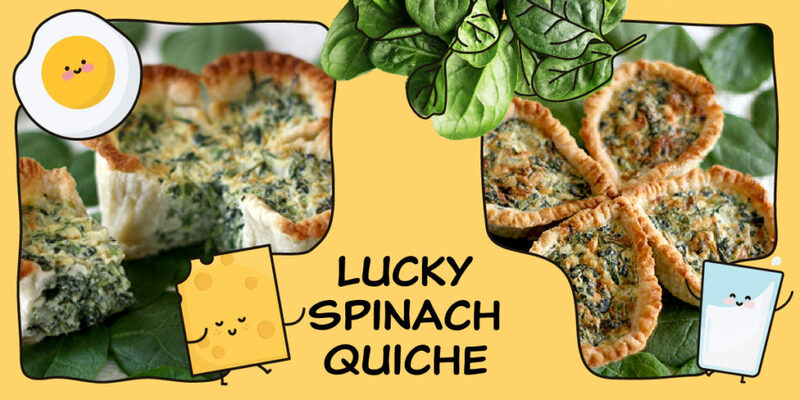 These lucky little spinach quiche are a great springtime dish either for a quick, re-heatable breakfast or party appetizers. With three forms of dairy, leafy greens, and protein, these are sure to satisfy. Take a pair of scissors and cut at four equally spaced points on the edge of the pot pie tin. One snip on the right, one on the left, one at the top, and one at the bottom. Start pushing the cut edges towards one another. Crease the pan side, right under the cut, so that the crease points inwards. Be careful because the edges are sharp. Start rounding out the rest of the pan edge, curving the pan edge. Repeat with the rest of the pan edges. This is what the pan should look like when you're done. Now, lightly spray the pan with nonstick spray. Roll out the dough between two sheets of plastic wrap. Split it into 3 equal squares and place each square in a shaped pan. Have the extra dough stick out inwards at the four points where the pie pan edges overlap. Take some foil and fold 12 little thick rectangles. Spray the rectangles with nonstick spray. Place each rectangle between the extra dough flaps on each crust. Press the dough into the bottom of each pan and around the foil rectangles. Take a fork and lightly prick the interior of each crust. Then use the fork tines to press into the top edge of the crusts. Refrigerate the crusts for 10 minutes. Then, fill and bake. Preheat oven to 425ºF. Mix the cream cheese with the eggs, one at a time. Mix in the half-and-half, salt, and pepper. Then add the rest of the ingredients: spinach, gruyere, parmesan, and onions. Mix. Shape the pâte brisée in either of the two methods described below. After the shape crusts are filled, place the aluminum tins on a baking sheet and bake the quiches for about 20 minutes. Cool for a few minutes. Carefully remove the quiches from the aluminum tins, line the baking sheet with parchment paper, and place the quiches on the lined sheet. Place the quiches back in the oven for 5-10 minutes until the crust sides crisp up a bit. Let cool for 10 minutes, then serve. The Nevada Dairymen represent the hard work and dedication of Nevada’s dairy farm families. The organization endeavors to provide its dairy-farmer investors with a return on their investment and enhance the financial stability of Nevada’s dairy industry while driving demand for locally-produced dairy products through coordinated marketing, dairy image and nutrition programs.